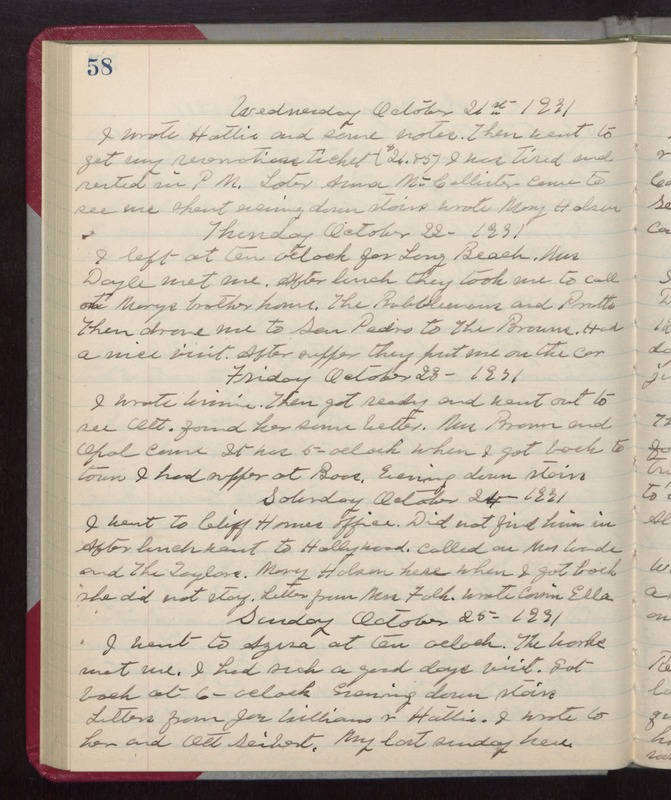 Wednesday October 21st 1931 I wrote Hattie and some notes. Then went to get my reservation ticket ($21.85) I was tired and rested in PM. Later Anna McCallister came to see me spent evening down stairs wrote Mary Holson Thursday October 22- 1931 I left at ten oclock for Long Beach. Mrs Doyle met me. After lunch they took me to call on Marys brother home. The Bubblemans and Pratts Then drove me to San Pedro to The Browns. Had a nice visit. After supper they put me on the car Friday October 23- 1931 I wrote Winnie. Then got ready and went out to see Ott, found her some better. Mrs Brown and Opal came It was 5-oclock when I got back to town I had supper at [Boos?]. Evening down stairs Saturday October 24- 1931 I went to Cliff Hornes office. Did not find him in After lunch went to Hollywood. Called on Mrs Wade and The Taylors. Mary Holson here when I got back she did not stay. Letter from Mrs Falk. Wrote Cousin Ella. Sunday October 25- 1931 I went to Azusa at ten oclock. The Works met me. I had such a good days visit. Got back at 6-oclock Evening down stairs Letters from Joe Williams & Hattie. I wrote to her and Ott Seibert. My last sunday here.